I was startled awake by my alarm when it went off at 6:50am Sunday morning – a not-so-auspicious sign. I was surprised that I hadn’t woken up easily, as I had gotten 11 hours of sleep on Friday night and now another 8.5 Saturday night before the race. But even though I didn’t wake up on my own, I was feeling pretty well-rested. I got all set to go and headed out the door. When I stepped out of the hotel, I was happy to discover that it really wasn’t that cold at all out. I was a tiny bit cool in what I was wearing, but not uncomfortably so. Plus, I knew that once I started running I’d be all set. Perfect running weather! What was not perfect, though, was when I got about 10 paces outside the door and suddenly realized I had forgotten my bib (which had the attached timing chip). That wouldn’t be good! I went back in to get it, and also grabbed my sunglasses that I had left behind as well. Oops! Now I was kind of glad I had forgotten my bib, so I could get my sunglasses too :) Then I was (hopefully) finally ready to walk to the start. Although I always carry tons of protein bars in my laptop bag (I like Quest bars even though I know the chemicals are terrible), I hadn’t thought to pack any kind of pre-race breakfast. I usually prefer something less protein-heavy and more balanced, like a Balance Bar or Detour Bar. Playing it safe and totally unadventurous, I had noticed that there was a Starbucks right near the Prado Museum (where the race started), so I thought I’d grab coffee and maybe some food there. I also figured I could use my Starbucks card and not “spend” money on breakfast… maybe a good thing given my (totally worth it) lunch splurge at StreetXO the day before. Unfortunately, it turns out that Starbucks locations in Spain don’t accept Starbucks gift cards. They also didn’t have any food that looked particularly appealing (yes, I was being totally picky)… so I just grabbed a coffee with hazelnut syrup and counted on that sweetener/caffeine for the energy. Good enough! After getting my coffee, I headed for the start – which turned out to only be a two minute walk away. The Paseo del Prado was totally closed off, and I got a kick out of strolling down the middle of the street. After getting to the actual start line, which was totally empty, I hung out for a few minutes before deciding I’d rather head to Starbucks to use that bathroom and wait there. Real bathroom > porta potties any day! 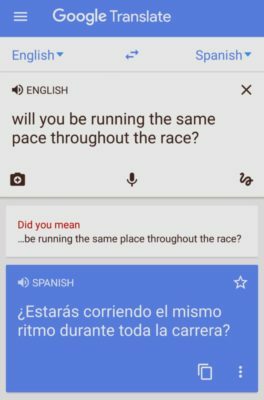 I lucked out – not only did I not have to wait long for the bathroom, but I met two expats who were also running the race. I have to admit, Friday got a little bit lonely thinking of a whole weekend exploring a cool city but not talking to anyone (especially since I don’t speak Spanish), so it was nice to make friends in line! While in line, we had gotten to chatting about our goal race times (mine: 1:45, which I really hoped wasn’t too aggressive) and then it came up that we’d probably need to know our target splits in kilometers, since that’s how the course would be marked. So while I was walking back over to the race start, I looked up a quick chart of minute per mile times and how those corresponded to minutes per kilometer. My pacing plan was to start at an 8:00/mile pace for the first 4.5 miles (which were slightly uphill), then drop to a 7:45/mile pace for the next 4.5 miles (which were slightly downhill), and then just try to go as hard as I reasonably could for the last 4 miles. Fortunately, that was easy to remember in minutes per kilometer: an 8:03/mile pace is 5:00/kilometer, and a 7:47/mile pace is 4:50/kilometer. Nice round numbers to work with! I also took a minute to figure out how to ask the pacers about their strategy! But then I saw there were only pacers for 1:35, 1:40, and 1:50 (but not 1:45), so I never put my learning to use. When I got back to the start this time, the corrals were now starting to fill up, and I slipped into place in the sub-1:45 corral. Would I really be able to run sub-1:45? I didn’t know, but I really hoped so – and even 1:45 and change would be awesome. I felt pretty good, and I did some warmup exercises in the corral (leg swings, etc) to try to get my legs ready to go and stave off any soreness. Taking two weeks nearly completely off from running had definitely eased my calf tightness, and I was hoping it would stay that way! As we got closer to the start time, the announcer told us how many minutes to go, and I started getting psyched. After my Garmin had gotten all messed up at the Louisville Trail Half, I made sure to start searching for signal early, and I was all set with that a few minutes ahead of time. There was no national anthem and not a lot of prelude in general… and then we were off! Despite the fact that the corrals were well-labeled (though not policed with bibs), there were a lot of people in front of me who went out at a pretty easy pace, so I spent the first few minutes doing a lot of bobbing and weaving to try to find a clear path to run. But I found my stride pretty quickly, and was pleased when I crossed the first kilometer mark in just under 5:00 – right on target! The Palacio Cibeles was pretty much right at the 1K mark. The 1:40 pace group started behind me yet had already passed me, even though I was shooting for a 1:45 finish with my pace. More on that pace group to come…. The first two kilometers took us straight up the Paseo del Prado, passing my hotel and the Plaza de Colon where I had been the day before. I knew that this part of the course was a slight incline all the way to the 7K mark at the turnaround, but it didn’t feel uphill – it felt reasonably comfortable. Since the course was marked in kilometers, I was checking my watch at every kilometer to see if I was on pace using the 5:00/kilometer pace for the first 7K. I was also simultaneously using my Garmin to figure out my mile splits (yes, this was a ton of watch checking and a ton of data). I was thrilled when I nailed the first mile in 7:55. Only 5 seconds ahead of pace! I always inadvertently go out way too fast, so I was incredibly excited and pleasantly surprised to be so close to my target. But then as I kept going on an otherwise unassuming stretch of road, I saw my Garmin pace suddenly drop into the 9:30/mile range. I figured that was just some sort of satellite glitch, and ignored it – even as it persisted for a while. Just after the 6K mark, we headed down into a tunnel and stayed down there for about half a kilometer. That was long enough for my Garmin to get totally messed up, and when I emerged on the other side of the tunnel at the 7K mark, I could see that it was really off. I had reached the 7K in 35:04 (so only about half a second per kilometer over my 5:00/kilometer goal), but I had definitely slowed down a bit between 6K and 7K if I was 15 seconds ahead at 6K and then 4 seconds behind at 7K. We descended back into the tunnel, came up on the other side, and then were rewarded with a really gentle downhill all the way back to the start. Woo hoo! I took advantage of this to pick up the pace a bit – but with my Garmin now being totally off, I didn’t really know how fast I was going. I still felt totally comfortable, but my Garmin was giving me splits of 3:48 for mile 5 (NOPE) and 5:16 for mile 6 (more reasonable, but still NOPE). I finally figured out that my Garmin had an extra 0.6 miles from where it should be – and in mile 7, it seemed to get back on track with splits (even though the distance was still off). If I add up my splits for miles 4-7, they combine to 18:58 for three miles, or a 6:20/mile pace… which seems incredibly aggressive. But, I was feeling good and running strong on the downhill, so… maybe? I wish I knew what happened! At 13K, though, I had a distraction: a small hill next to the Palacio di Cibeles, leading up to the Plaza de la Independencia. When I say small, I do mean small – it was only maybe a tenth of a mile to the top, and then we hairpin turned and came right back down the other side of the street. But it was enough to feel like a bit of a challenge and force me to put some effort into it, rather than running super easy like I had been doing so far. 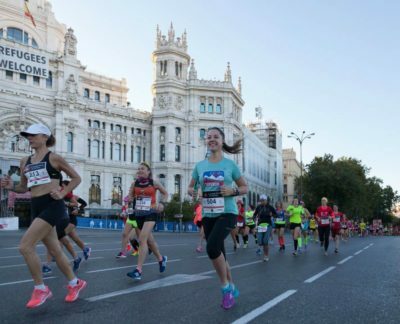 My watch ticked across the 9 mile mark (which was really 8.4 miles) right when I got back down to the Palacio di Cibeles, and including that hill, it registered 7:24. This ended up being my slowest mile of the race (after those first 4 uphill miles); however, it was still 21 seconds faster than I had planned to be going at this point, since I was hoping to hold a 7:45/mile pace after the 7K uphill. I couldn’t believe how well I was doing, but I also knew that I still had some difficult late miles that might slow me down like they had done in Louisville, so I didn’t want to count my chickens just yet. We headed up the Gran Via on another hill, this one about twice as long as the one we had just done by Cibeles. But rather than worrying about the hill, I was busy marveling at the gorgeous architecture all around me. I considered taking a photo, but I hadn’t taken one during the race thus far and I got it in my head that it would be bad karma to mess with what I had been doing. Everything was going so well, and I didn’t want to risk messing it up one bit! From here, the course flattened out, but had a lot of twists and turns as we ran right through the center of Madrid. I tried my best to run the tangents, but I wasn’t always entirely sure where we were going to go next. I have to say, this race was phenomenal in terms of the course and scenery! There was a lot of beauty and a ton of variety as well. 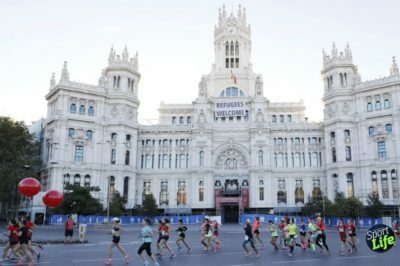 The course was well-roped off from spectators and general pedestrians, but we were running right through some of Madrid’s most famous and busy plazas (like the Plaza del Sol), which was pretty neat. I don’t think I’ve done a city race before that took us through as many plazas / sidewalks vs regular old roads, so this was a real treat. We finally burst out of the narrow plazas onto a main street right by the opera and the Palacio Real, just as my watch clicked over to 10.6 miles (which was really 10.0 miles). My goal at this point had been to be under 80 minutes (an 8:00 pace), but I was only at 76 minutes! I realized that at this point, even if I ran 8 minute miles the rest of the way (which I hadn’t done since the uphill), I’d finish in 1:40… which was pretty much a dream time for me. If I could stick with 7:30s (which I was beating), I’d finish in 1:38; and if I could get down to 7:00s, I’d be down to 1:37. Game on! Adam had told me to start pushing hard when I got to the 10 mile mark, but I was still scared I’d blow up from my lack of training beyond 10 miles… so I wasn’t ready to really go for broke. I maintained an aggressive-but-comfortable pace for the next few kilometers, with my Garmin clocking me at 7:07/mile pace for mile 11 and 6:50/mile pace for mile 12. What a difference my Orangetheory speedwork has made! I remember when 7:00 for one mile seemed like a crazy fast dream, but now it felt like a solid-effort-but-not-bad pace, which was especially amazing to me given that I was nearing the end of the race. I still wasn’t giving it everything I had, but I wasn’t going easy either. When we passed the 19K mark, I couldn’t believe it: only 2K (a little over 1.2 miles) to go! I dialed in my pace just a little bit more, reminding myself that even at a 5:00/kilometer pace I’d be done in ten minutes. (And in actuality, I later learned I was averaging a 4:23/kilometer pace for the last 6K.) I continued passing a lot of other runners in this section who were getting tired, but I still felt fully energized and like I could keep running a lot longer. My Garmin clocked my final full mile split at 6:31 pace, just as I crossed the 20K mark. Only three quarters of a mile to go! We headed for an out-and-back that I knew must be near the finish line, but I still didn’t see it ahead. I focused on going harder still, finally picking it up to a pace that felt challenging. As I look back on the race now, this last mile was the only one where I was feeling breathless and like I was working really hard – I couldn’t believe how easy the rest had felt! This was just the perfect race day. We took a left onto a cobblestoned road just as my watch clicked over to 13.5 miles. With my Garmin being off by 0.6 miles, I knew this meant I had less than a quarter mile to go. I tried to pick up the pace as best as I could, but the cobblestoned road unfortunately didn’t make it easy. This was probably the only thing I didn’t love about this race – I wanted to be able to go faster here :( But that’s really a small complaint in the grand scheme of things! During the race, this thought went through my mind… but only for a split second before I was back to excitement and positivity. I was so happy and so excited at this point in the race, realizing that I had beaten my goal by quite a bit and was about to have the biggest PR of my life! We took one more quick left, and now I could see and hear the finish festival. I picked up my pace as much as I could with the cobblestones, and then took one final right into the finish chute. Smooth ground at last! 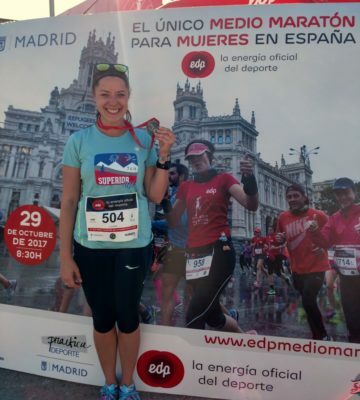 Even before I crossed the finish line, I felt incredibly proud of how well I had done – I knew that I had PRed by more than 12 minutes, which was unbelievable to me. Especially when I had been injured and unable to put any training in between my trail half and this one! The video shows me triumphantly crossing the line, but after the race, I walked around the finish festival for about 20 minutes with the biggest grin on my face. I couldn’t believe how fast I had run, and I felt great, besides! I wouldn’t say that I could have gone faster and this wasn’t representative of my abilities (though I did wonder how I might have changed my pacing strategy if I had been shooting for 1:35ish rather than 1:45). But this finish time was so far beyond my wildest expectations that it made me wonder if I’m selling myself short. Beaming with pride in front of the photo station at the finish. 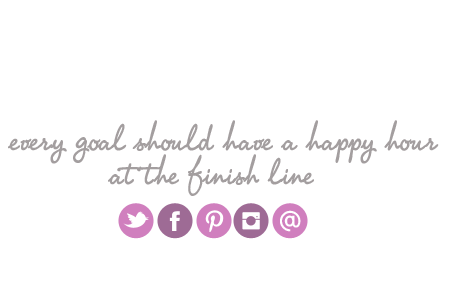 I’m now a double digit (97 minute) half marathoner – how unbelievable is that?! I cannot believe that I managed to hold a pace in the 7s for all that time… and it just makes me so incredibly proud of how far I’ve come. I definitely attribute a lot of this to Orangetheory, which has gotten me much more comfortable with aggressive speeds to where they feel like normal speeds. However, I also kind of blame Orangetheory for my calf injury, since I think it might be a result of going too fast. I’m planning to cut back on my all-out speed (11.0-12.0mph, never held for more than one minute) and take all my sprints down to 10.0mph (6:00/mile). To make up for that drop, I’ll instead turn the Orangetheory “walking recoveries” into running recoveries – I’m hoping that will still keep my heart rate up even if I’m not pounding quite as hard at the fast speeds. But since I don’t run those sub-6 minute speeds anywhere outside Orangetheory, I don’t think it’s necessary for me to train with them. With regard to training: in the month leading up to the race, I ran 8 miles (once), 10 miles (once), and 13.1 miles (once) – and those were my only runs in 2.5 years that were longer than 10K. When I signed up for this race after the Louisville Half, I wanted to get a few more long runs under my belt and really see how fast I could go, but my annoying calf injury kept me from doing anything but resting. All that rest probably contributed to me running an awesome time, but now I’m wondering: what if I really train to go fast at the half marathon distance? I thought after the Louisville Half that maybe I’m just not as good at distance running, and should go back to my sub-20 5K goal (which I still haven’t nailed)… but now this race has me wondering if the half marathon is my sweet spot. It’s long enough to require some level of endurance, but it’s short enough that I can still go (what I consider to be) fast. So maybe I should train and sign up for another? I’m totally undecided which way to go from here.